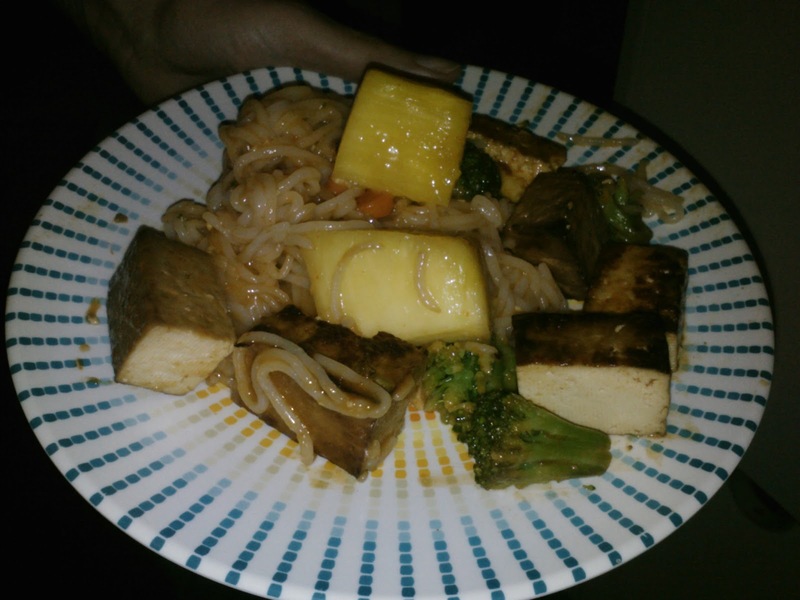 Fast Sunday night dinner...Basically it is a package of baked tofu (Teriyaki flavored), some left over frozen veggies and fresh pineapple with fresh rice noodles. I cooked the veggies with tofu while boiling the water/noodles. I added the noodles to the oan, the pineapple and the sauce. Sauce: a dash of Sriracha, a tablespoon of fresh pineapple juice from the pineapple chunks, a squirt of Braggs and about a teaspoon of rice vinegar. Dump it over the mix and let it heat up and serve. Note: The fresh rice noodles from TJ's are hard to work with. They turn into a huge clump once cooked. I tried my hardest to break them up with no luck!